ATOMIC ROBO is an inter-dimensional comedic monster-snuffing, evil doer-stopping gambol set mostly in the early- to mid-1900s. 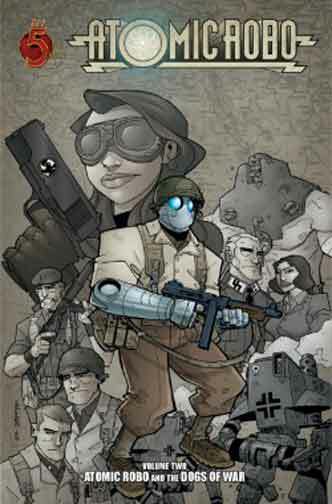 Robotic, smart and smart alecky, Robo serves his creator, Nikola Tesla, in this action-adventure-sci-fi extravaganza. Two things make ROBO work well: whit and whimsy. The writing is sagacious but unpretentious, and the art is fanciful without being elementary. Brian Clevinger's humor is clever, thoughtful, and dry. He gives even the most seasoned reader (comics or otherwise) something memorable to laugh with and enjoy. Scott Wegener's art is a colorful palette of clear, uncluttered manga-influenced images with a clean panel flow. Wegener knows how to direct the eye through the page and he is well trained in using different panel configurations on a page to tell the story. 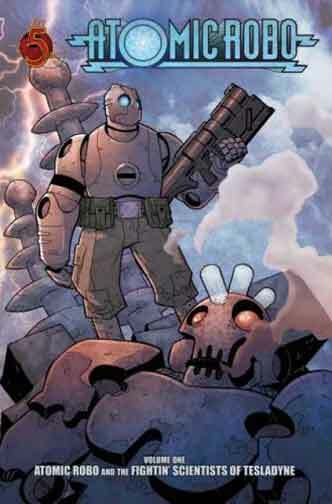 ATOMIC ROBO is a fine example of a book that should come with different ratings. For home, ROBO is fine for ages 10 and older. Any younger and the child would need assistance with the vocabulary. For school, on the other hand, the mild cursing and few obscure sexual references might just be enough to get an elementary teacher in trouble. There is some mild cursing and some sexual references. 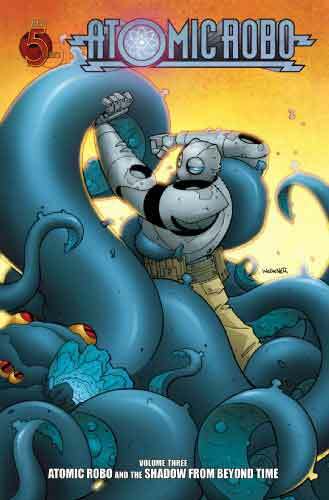 ATOMIC ROBO uses a complex narrative structure to tell some tales. The story flashes forward, backward and I could swear there was a flash sideways in there somewhere. Volume 3 is particularly complex as the story deals with space and time. Some things take place in the past, future and present simultaneously. It can make the issues seem incoherent, but with reassurance from the teacher, and some help, the story can be connected and understood and enjoyed. There are mild sexual references in our comic? Man, they flew right over my head! Haha!